Russian: Пру́ссия) was a German kingdom and historic state originating out of the Duchy of Prussia and the Margraviate of Brandenburg. For centuries, the House of Hohenzollern ruled Prussia, successfully expanding its size by way of an unusually well-organised and effective army. Prussia shaped the history of Germany, with its capital in Berlin after 1451. In 1871, German states united in creating the German Empire under Prussian leadership. In November 1918, the monarchies were abolished and the nobility lost its political power. Prussia was effectively abolished in 1932, and officially abolished in 1947. 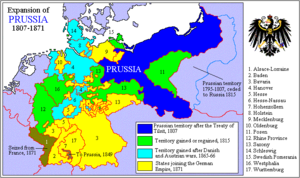 The name Prussia derives from the Old Prussians. In the 13th century, German crusaders, the Teutonic Knights, conquered "Old Prussia". In 1308 the Teutonic Knights conquered the formerly Polish region of Pomerelia with Gdańsk (Danzig). Their monastic state was mostly Germanised through immigration from central and western Germany and in the south, it was Polonised by settlers from Masovia. The Second Peace of Thorn (1466) split Prussia into the western Royal Prussia, a province of Poland, and the eastern part, from 1525 called the Duchy of Prussia, a fief of the Crown of Poland up to 1657. The union of Brandenburg and the Duchy of Prussia in 1618 led to the proclamation of the Kingdom of Prussia in 1701. At the Congress of Vienna (1814–15), which redrew the map of Europe following Napoleon's defeat, Prussia acquired a large section of north western Germany, including the coal-rich Ruhr. The country then grew rapidly in influence economically and politically, and became the core of the North German Confederation in 1867, and then of the German Empire in 1871. The Kingdom of Prussia was now so large and so dominant in the new Germany that Junkers and other Prussian elites identified more and more as Germans and less as Prussians. The Kingdom ended in 1918. In the Weimar Republic the state of Prussia lost nearly all of its legal and political importance by 1932. The old Prussian élites played a passive role in the Nazi regime; Prussia was legally abolished in the 1940s. East Prussia lost all of its German population after 1945, as Poland and the Soviet Union absorbed its territory. 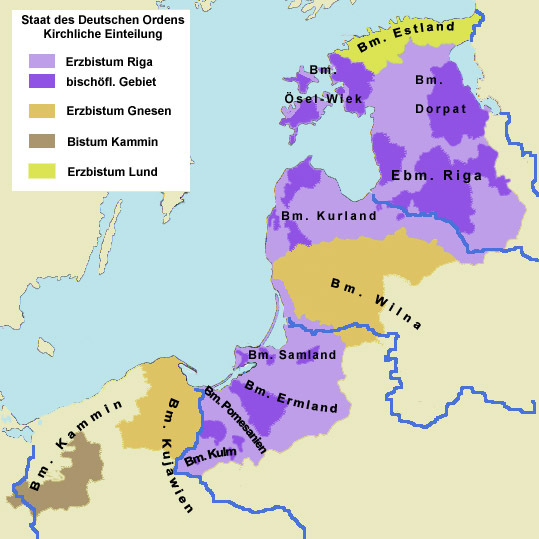 Before its abolition, the territory of the Kingdom of Prussia included the provinces of West Prussia; East Prussia; Brandenburg; Saxony (including much of the present-day state of Saxony-Anhalt and parts of the state of Thuringia in Germany); Pomerania; Rhineland; Westphalia; Silesia (without Austrian Silesia); Lusatia; Schleswig-Holstein; Hanover; Hesse-Nassau; and a small detached area in the south called Hohenzollern, the ancestral home of the Prussian ruling family. The land that the Teutonic Knights occupied was flat and covered with rich soil. The land was perfectly suited to the large-scale raising of wheat. The rise of early Prussia was based on the raising and selling of wheat. Teutonic Prussia became known as the "bread basket of Western Europe" (in German, Kornkammer, or granary). The port cities of Stettin (Szczecin) in Pomerania, Danzig (Gdansk) in Prussia, Riga in Livonia, Königsberg (Kaliningrad) and Memel (Klaipėda) rose on the back of this wheat production. Wheat production and trade brought Prussia into close relationship with the Hanseatic League during the period of time from 1356 (official founding of the Hanseatic League) until the decline of the League in about 1500. As a result of the Treaty of Versailles in 1919, the Second Polish Republic was granted not only these two areas, but also areas with a German majority in the Province of West Prussia. After World War II, East Prussia, Silesia, most of Pomerania and the eastern part of Brandenburg were annexed by either the Soviet Union or Poland, and the German-speaking populations expelled. In 1211 Andrew II of Hungary granted Burzenland in Transylvania as a fiefdom to the Teutonic Knights. In 1225, Andrew II expelled the Teutonic Knights from Transylvania, and they had to transfer to the Baltic Sea. Konrad I, the Polish Duke of Masovia, unsuccessfully attempted to conquer pagan Prussia in crusades in 1219 and 1222. In 1226, Duke Konrad invited the Teutonic Knights, a German military order of crusading knights, headquartered in the Kingdom of Jerusalem at Acre, to conquer the Baltic Prussian tribes on his borders. In the course of the Ostsiedlung process, settlers were invited in, a majority of them Germans, bringing about changes in the ethnic composition as well as in language, culture and law. Low German became the dominant language. In 1525, Grand Master Albert of Brandenburg-Ansbach, a member of a cadet branch of the House of Hohenzollern, became a Lutheran Protestant and secularised the Order's remaining Prussian territories into the Duchy of Prussia. This was the area east of the mouth of the Vistula River, later sometimes called "Prussia proper." For the first time, these lands came into the hands of a branch of the Hohenzollern family. (The Hohenzollern dynasty had ruled the Margraviate of Brandenburg to the west, a German state centered on Berlin, since the 15th century.) Furthermore, with his renunciation of the Order, Albert could now marry and produce legitimate heirs. Frederick I was succeeded by his son, Frederick William I (1713–1740) the austere "Soldier King", who did not care for the arts but was thrifty and practical. He is considered the creator of the vaunted Prussian bureaucracy and the professionalized standing army, which he developed into one of the most powerful in Europe, although his troops only briefly saw action during the Great Northern War. In view of the size of the army in relation to the total population, Mirabeau said later: Prussia, is not a state with an army, but an army with a state. Also, Frederick William settled more than 20,000 Protestant refugees from Salzburg in thinly populated eastern Prussia, which was eventually extended to the west bank of the River Memel, and other regions. In the treaty of Stockholm (1720), he acquired half of Swedish Pomerania. By defeating the Austrian Army at the Battle of Mollwitz on 10 April 1741, Frederick succeeded in conquering Lower Silesia (the northwestern half of Silesia). In the next year, 1742, he conquered Upper Silesia (the southeastern half). Furthermore, in the third Silesian War (usually grouped with the Seven Years War) Frederick won a victory over Austria at the Battle of Lobositz on 1 October 1756. On 3 November 1760 Frederick won another battle—the decisive battle—the Battle of Torgau. With this victory and the overall victory in the Seven Years War, Frederick, allied with Great Britain, Hanover and Hesse-Kassel, was able to hold the whole of Silesia against a coalition of Saxony, Austria, France and Russia. Voltaire, a close friend of the king, once described Frederick the Great's Prussia by saying "...it was Sparta in the morning, Athens in the afternoon." From these wars onwards the Austria–Prussia rivalry dominated German politics until 1866. During the reign of King Frederick William II (1786–1797), Prussia annexed additional Polish territory through further Partitions of Poland. His successor, Frederick William III (1797–1840), announced the union of the Prussian Lutheran and Reformed churches into Prussian Union (Evangelical Christian Church)|one church. After the defeat of Napoleon in Russia, Prussia quit its alliance with France and took part in the Sixth Coalition during the "Wars of Liberation" (Befreiungskriege) against the French occupation. Prussian troops under Marshal Gebhard Leberecht von Blücher contributed crucially (with the British) in the Battle of Waterloo of June 1815 to the final victory over Napoleon. Prussia's reward in 1815 at the Congress of Vienna was the recovery of her lost territories, as well as the whole of the Rhineland, Westphalia, and some other territories. These western lands were to be of vital importance because they included the Ruhr Area, the centre of Germany's fledgling industrialisation, especially in the arms industry. These territorial gains also meant the doubling of Prussia's population. In exchange, Prussia withdrew from areas of central Poland to allow the creation of Congress Poland under Russian sovereignty. Prussia nationalised its railways in the 1880s in an effort both to lower rates on freight service and to equalize those rates among shippers. Instead of lowering rates as far as possible, the government ran the railways as a profitmaking endeavour, and the railway profits became a major source of revenue for the state. The nationalisation of the railways slowed the economic development of Prussia because the state favoured the relatively backward agricultural areas in its railway building. Moreover, the railway surpluses substituted for the development of an adequate tax system. Almost all of Germany's territorial losses, specified in the Treaty of Versailles, were areas that had been part of Prussia: Eupen and Malmedy to Belgium; South Jutland to Denmark; the Memel Territory to Lithuania; the Hultschin area to Czechoslovakia. Many of the areas which Prussia had annexed in the partitions of Poland, such as the Provinces of Posen and West Prussia, as well as eastern Upper Silesia, went to the Second Polish Republic. Danzig became the Free City of Danzig under the administration of the League of Nations. Also, the Saargebiet was created mainly from formerly Prussian territories. East Prussia became an exclave, only reachable by ship (the Sea Service East Prussia) or by a railway through the Polish corridor. In contrast to its prewar authoritarianism, Prussia was a pillar of democracy in the Weimar Republic. This system was destroyed by the Preußenschlag ("Prussian coup") of Reich Chancellor Franz von Papen. In this coup d'état, the government of the Reich deposed the Prussian government on 20 July 1932, under the pretext that the latter had lost control of public order in Prussia (during the Bloody Sunday of Altona, Hamburg, which was still part of Prussia at that time) and by using fabricated evidence that the Social Democrats and the Communists were planning a joint putsch. The Defence Minister General Kurt von Schleicher, who was the prime mover behind the coup manufactured evidence that the Prussian police under Braun's orders were favouring the Communist Rotfrontkämpferbund in street clashes with the SA as part of an alleged plan to formet a Marxist revolution, which he used to get an emergency decree from President Paul von Hindenburg imposing Reich control on Prussia. 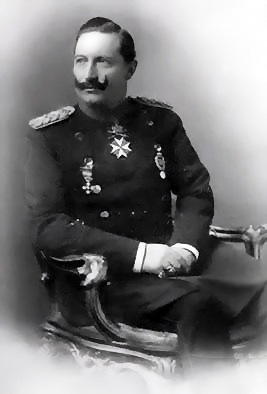 Papen appointed himself Reich commissioner for Prussia and took control of the government. The Preußenschlag made it easier, only half a year later, for Hitler to take power decisively in Germany, since he had the whole apparatus of the Prussian government, including the police, at his disposal. Because the Reichstag building had been set on fire a few weeks earlier, the new Reichstag was opened in the Garrison Church of Potsdam on 21 March 1933 in the presence of President Paul von Hindenburg. In a propaganda-filled meeting between Hitler and the Nazi Party, the "marriage of old Prussia with young Germany" was celebrated, to win over the Prussian monarchists, conservatives and nationalists and induce them to vote for the Enabling Act of 1933. In the Western Zones of occupation, which became West Germany in 1949, the former Prussian territories were divided up among North Rhine-Westphalia, Lower Saxony, Hesse, Rhineland-Palatinate and Schleswig-Holstein. Württemberg-Baden and Württemberg-Hohenzollern were later merged with Baden to create the state of Baden-Württemberg. Until after the Thirty Years' War, the territories of Brandenburg-Prussia were politically independent from each other, connected only by the common feudal superior. Frederick William, who envisioned the transformation of the personal union into a real union, started to centralise the Brandenburg-Prussian government with an attempt to establish the Geheimer Rat as a central authority for all territories in 1651, but this project proved to be unfeasible. Instead, the elector continued to appoint a governor (Kurfürstlicher Rat) for each territory, who in most cases was a member of the Geheimer Rat. The most powerful institution in the territories remained the governments of the estates (Landständische Regierung, named Oberratsstube in Prussia and Geheime Landesregierung in Mark and Cleves), which were the highest government agencies regarding jurisdiction, finances and administration. 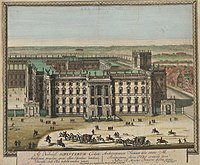 The elector attempted to balance the estates' governments by creating Amtskammer chambers to administer and coordinate the elector's domains, tax income and privileges. Such chambers were introduced in Brandenburg in 1652, in Cleves and Mark in 1653, in Pomerania in 1654, in Prussia in 1661 and in Magdeburg in 1680. 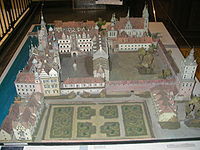 Also in 1680, the Kreditwerk came under the aegis of the elector. ↑ 9.0 9.1 9.2 9.3 Büsch, Otto; Ilja Mieck, Wolfgang Neugebauer (1992). Otto Büsch. ed (in German). Handbuch der preussischen Geschichte. 2. Berlin: de Gruyter. pp. 42. ISBN 978-3-11-008322-4. ↑ Edward Henry Lewinski Corwin Lewinski-Corwin, Edward Henry (1917). A History of Prussia. New York: The Polish Book Importing Company. pp. 628. http://books.google.com/?id=Ec4eAAAAMAAJ&printsec=titlepage&dq=lizard+union#PRA2-PA45,M1. ↑ Avnery, Uri (2002). "The Army has a State". Media Monitors Network. http://www.mediamonitors.net/uri79.html.